I am afraid I will be missing most of March with all of you my friends. My caseload has risen to almost a ridiculous amount of kids. My problem is I can't say no when I hear some little one is in need, I always think I can fit them in somehow. There were 34 one hour treatments over four days last week, and that does not include the two that canceled. Nor does it include my drive time which is extreme. Ah well this will pass and it will all even out. I am trying hard to get most of my paperwork done on Friday, my day off, so I have the weekend free for one little six year old I know and his two fury brothers. Saturdays and Sundays start off the best. Even this ridiculous Sunday with day light savings time. 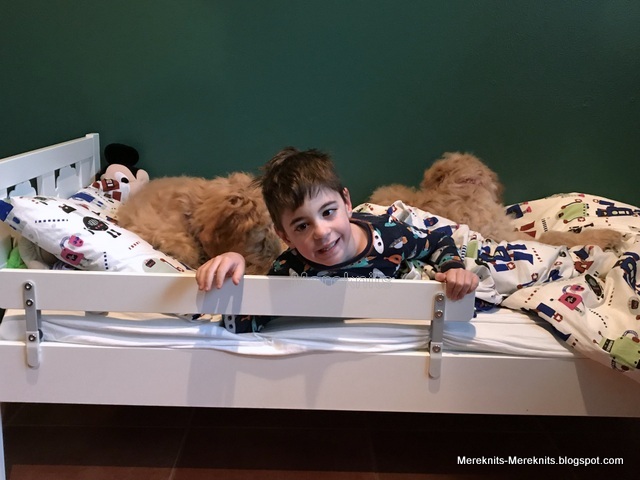 Little Buddy likes to start his, "S" days in bed with the boys. They walk all over him and he laughs and laughs. They lick his face and basically trap him under his covers. He loves it! We have gone to a gardening/social/communication club hosted by his retired Pre-K teacher the last few Saturdays. She was testing it out to see if this is something that would be beneficial for the kids. I thought it was great and a good way for Little Buddy to interact with kids outside of school. It will start back up in April. I asked her to try and figure out a camp or two for the summer. It is so hard to stimulate Little Buddy as he can't go to regular camps because he is still in pull-ups and he has special needs. I work all summer so I can't take him on field tips here and there. His teacher is thinking about how to host morning camps a few weeks over the summer. It would help him so much to be engaged in an activity with people I trust him to be with. Little Buddy and I went to the shoe store after gardening club yesterday. I have the hardest time finding him sneakers that fit over his braces. I thought I would give it another try before resorting to Crocs again. Look what we found! 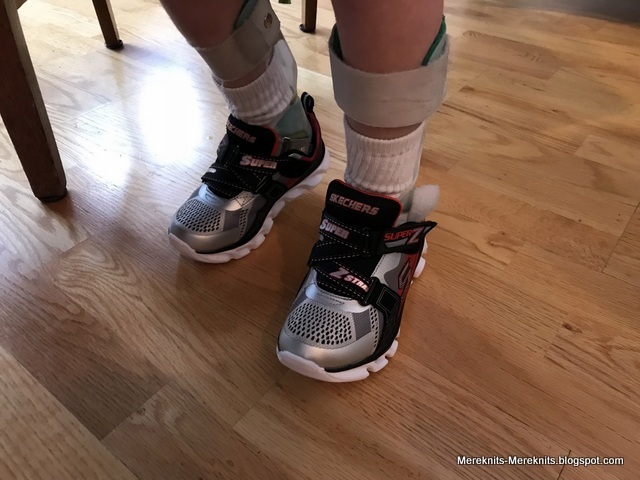 They have this great Velcro z-strap that makes it easy to get his brace in and out of the shoes as the shoe opens up really wide. He loves them and to make it even better they light up when you stomp your feet. He has been stomping all over the place. They only had this color but a quick look online when we got home found a green pair that is now on the way to our house. Lets hope they hold up a bit better then the last pair of sneakers I bought him which wore out after three weeks. I also found these great shoes for me! As you can see I bought them in two colors. 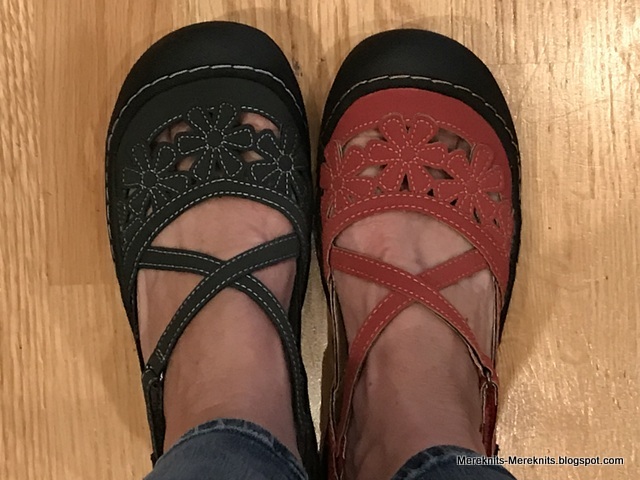 They are the Blossom Mary Jane's by Jambu. And they were on sale! Perfect for me for work this summer. The boys are getting bigger every single day as you can see by the photos. They are so darling. Mr. 20 made it home for Spring Break last night and I swear they would not stop licking his face. Even when he tried to get up and get away they would climb up him and just lick him. I think Mr. 20 was tickled at their behavior. The only casualties this week were my leather sofa and a pillow. The leather sofa is my fault as they went for a tag on it a few weeks ago and I did not cut it off when I should have. So we now have some teeth marks and a bit if a tear in the corner of the sofa. I ordered some patches for it until they are old enough to not bite it again and then I will get it professionally repaired. Puppies! What can I say? March is just going to be the worst month for me as far as paperwork and work. I have six major reports to write and they take up a lot of time. I am already done with two but can't move onto the others yet as they have a specific due date. I am so sorry if I will be missing out reading and commenting on your blogs. I am going to try and keep up, but please excuse me if you don't hear from me. April might be a little easier. I don't know how you do what you do and fit so much in.You must be permanently exhausted and I can't see there being any "Meredith" time in there.Take you don't overdo it.The puppies are growing at an amazing rate. love all your new shoes!!! Meredith that is quite the work load. Just try to take care of yourself in there somewhere. Little Buddy and his new shoes look fabulous! He has such a cute smile. I love the 'furry' boys also, growing like weeds. Hugs! What a workload! I hope you'll be able to reduce your case load a little in April, it sounds like a lot of work and long hours. I'll be posting some extra energy for you. Love the sneakers and your shoes, too. I am in dire need fo shoes, I live in sneakers most of the time, which is just not very ladylike. It is so hard to say 'no' when there are people in need. Bless you, Meredith, and I hope it eases up for you in April. In the meantime, be kind to yourself. It's so good to see LB having fun with those puppies! I hope something works out for him for the summer. Have a good week, and hang in there! No problem I know how life can get in the way sometimes. I wonder how much bigger those pups will get in the mean time...LOL...they are as big as Little B already! LOVE those shoes!! Little B's are pretty cool too. Dear, Mere, you know I understand. My worst paperwork crunch of the year was in the fall this year. And paperwork for little ones is even worse than school IEPs! I'll have another crunch at the very end of the year doing graduation pages for my seven seniors! I am very upset about the lack of summer programming for LB. Doesn't the school district do summer school? ESY is required by federal law! Also, there must be a camp somewhere that would take LB and deal with diapering. Here, the Jewish day camp is the most flexible. One summer my son (then age 15) was a one-on-one counselor for a boy with very severe autism. It was a great experience for him. Then, a couple years later, the camper showed up on my middle school caseload. Maybe my retirement job will be running a summer camp for kids like LB! But not in Tampa -- too hot! Take care yourself this month! 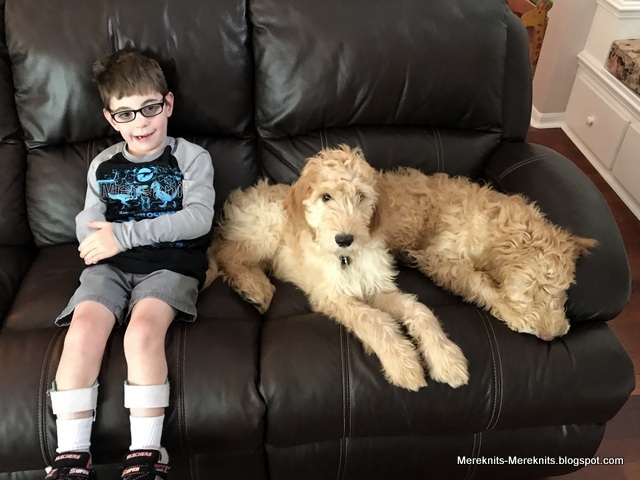 Thank you Meridith for sharing such great Buddy and the rapidly growing pups plus great shoe finds today and letting us know that you are working so hard !!! and are OK too. Hugs. See you when you can carve out a bit of time to post. At least you're not bored with life! :-} Hope you get caught up soon on your paperwork and thanks for caring for those children...i'm sure it's a good thing in many ways. 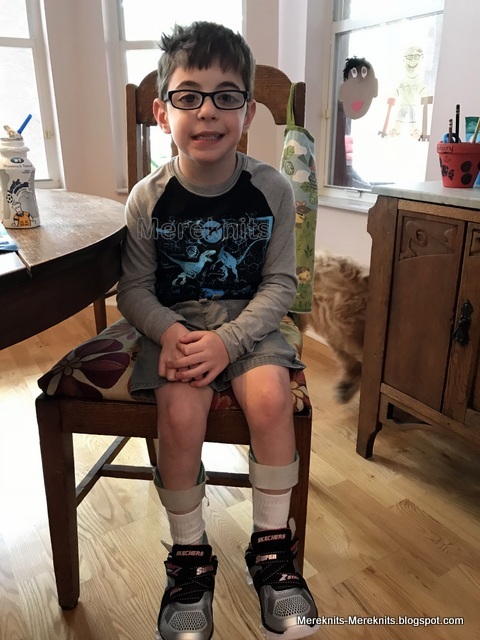 love the fact that you found Little Buddy shoes that work for him and a fun pair for you. Mary Janes are cute and would love to be able to wear them but they don't. Sigh! Take care and find some time for yourself to relax a bit! Hugs! I am going to miss those pup pix but I get it. March was my worst month when I was teaching. I always said if I could get through March I could get through anything. In my experience, Skechers actually hold up pretty well! They are some pretty snazzy kicks!!! I love your Jambu shoes too. Aren't they just the best. I haven't found a store here that sells them. Hope you get through March --- I'll be sending good vibes your way. I honestly don't know how you get everything done. We'll be here whenever you have time to visit. Love the puppies in bed with LB. They look like they adore him and I'm sure the feeling is mutual. His shoes are great and so are yours. I need some cute shoes like that! Please take care of yourself my friend. I've learned the hard way that sometimes "No" has to be part of your vocabulary for your health. I feel exhausted just reading about your workload, and then there's the family and home life on top of that, I don't know how you do it. I see both you and Little Buddy have got snazzy new shoes, they both look great. Hope things soon start to calm down a little for you. Your workload sounds scary but you appear to be handling everything so well. Beautiful pictures of your boys! just rest as much as you can between the lines! and Mr 20 who loves to be puppy kissed! I love the photos of Little Buddy and the pups. Little Buddy’s shoes are fun and very cool looking. As eveyone else has said, remember to take some time for yourself. I know, sometimes easier said then done, but it is so very important. So, life shifts for a while and we have to go with it and not be a misery while we do it. Love your peoples and we will see you soon. Be sure and get some sleep and laugh when you can!!!! I honestly don't know how you manage it all! But you do an amazing job! I'm sure the families of those little ones in need greatly appreciate your work! 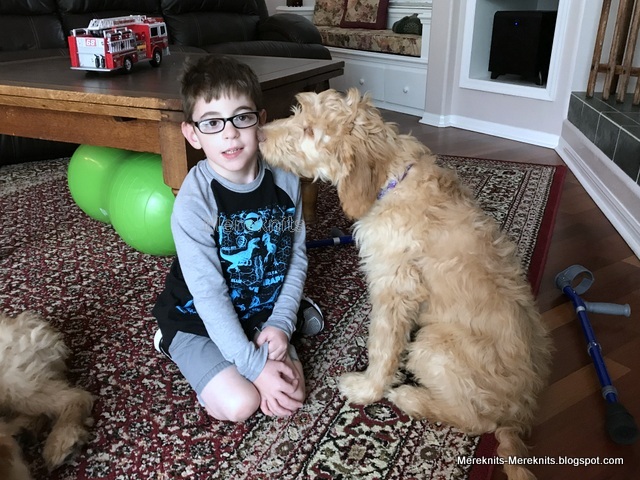 Having a special needs son, I know how hard it is to get services, but also to find a therapist who would be able to establish a trusting relationship with my son and really help. Oftentimes therapists come and go, especially young ones. It's a hard and challenging work, and not everyone can handle it. So I just want to tell you: Thank you! Thank you so much for helping families like my family and helping special needs children like my son! And on top of all that, you are doing this amazing job of raising Little Buddy and taking care of your family! You're are incredible Meredith, you really are! God Bless you! 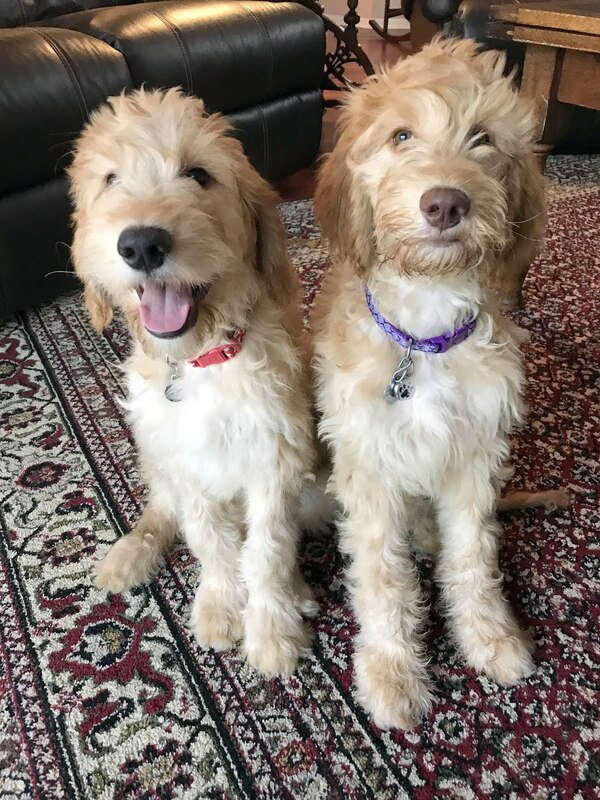 Good thing you took photos of the puppies for the fifteen minutes they actually *were* puppies! They grew so fast. Paperwork is the worst part of every job. Good luck with all of that. Stay strong. Little Buddy looks so grown up in his new sneakers. Glad that you found a nice sneaker. Little Buddy is one adorable boy. Oh Meredith, I've read your blog for some time, but not commented much. This post really struck me--yes, you're incredible, and the need is so great, but you're as important as any of your clients. Would your parents be trying to find someone to help you deal with these extreme challenges, as you help your clients? I suppose you would never be able to not schedule another appointment for someone who needs you, so you could rest and recuperate, but I do hope you can find an intermediary to schedule those appointments, who can say that you are all booked up, and perhaps suggest another provider. And really, if there are no other providers, I hope you can trust in the life force and the goodness of most humans to step in where you aren't able to. Little Buddy, and you yourself are as important as the ones who need your help, so please try to be kind to yourself, and accept that this crazy world needs you to stay okay, not just to help other people, but because you are a force for good in the universe (and we love you). I do not know how you keep up at all with your work load, the puppies (adorable) and Little Buddy. The three of them are so cute. What nice companions for each other. 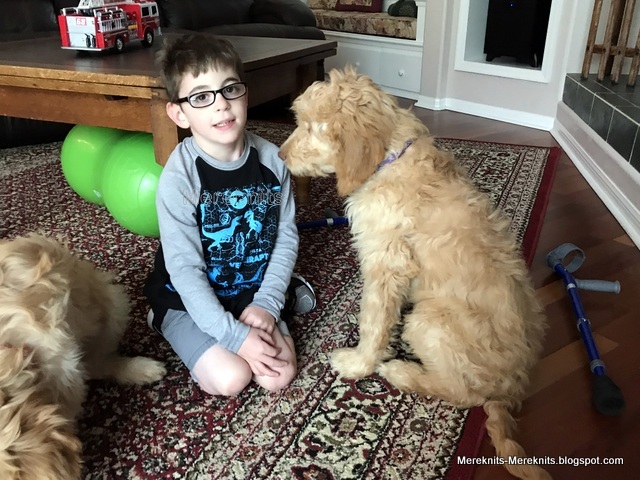 Love the photos of LB and the pups, oh, and your shoes, too! That is some workload you have; you sure keep busy. Hope you find a little me-time somewhere in the busyness. Hugs to you from the PNW! Oh my, you have been very busy!! Where do you keep getting the energy from? Both your shoes are lovely and I hope there will be a good solution for Little B to give him a nice summer! You are keeping yourself very, very busy. You never have to apologize for feeling like you can't keep up. Great tennie shoes for Little B. And yours look very comfy. I have hard feet to fit so really hate shoe shopping. Wow, that sounds a little bit to busy 😉. Lovely pictures!